Amnesty International has called on all governments not to transfer suspects of the 1994 genocide to Rwanda for trial. There are serious concerns about the ability of the country's justice system to try them fairly and impartially, the human rights group said. In June, Rwanda abolished the death penalty which it hoped would enable countries that object to capital punishment to extradite suspects. The Rwanda tribunal based in Tanzania has since asked to transfer a case. The most high-profile genocide cases are being tried by the UN-backed International Criminal Tribunal for Rwanda (ICTR) in Arusha. Since 1997 the ICTR has convicted 28 people and acquitted five and frustrated at its slow process, Rwanda wants suspects transferred to face trail at home. 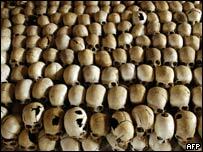 Some 800,000 Tutsis and Hutu moderates were slaughtered during the country's 100-day genocide in 1994. Amnesty also urged the ICTR not to transfer any of its cases to Rwanda until the government can demonstrate that trials would be conducted in accordance with international standards. Rwanda had to do more to guarantee the protection of all victims and witnesses, it said. But Rwanda rejected Amnesty's objections. Some 12,000 local gacaca courts have been used in Rwanda to speed up the process of bringing those responsible for the genocide to justice. "If it's about protecting victims and witnesses, that is a test we have already passed and need no more lessons," Rwanda's Prosecutor General Martin Ngoga told Reuters news agency. Rwandan Justice Minister Tharcisse Karugarama told the BBC's Focus on Africa programme that Rwanda had tried more genocide suspects than any other country, and that thousands of people had been acquitted. He said that although Rwanda's prison system was not perfect, the prison population had decreased from over 200,000 in the year following the genocide to around 60,000 today. Amnesty's Africa programme director Erwin van der Borght said the group fully supported "the development of the national justice system in Rwanda". "But until we are satisfied that all the criteria necessary for fair and impartial trials are met, we urge the ICTR and national governments to refuse to transfer any cases to Rwanda," he said. The ICTR is due to complete its work by 2010.